Since the mid 1990s food allergies have gone from being pretty rare to very common. An estimated 6-8% of children under the age of 3 in Canada suffer from food allergies, that’s approx 300,000 kids and the numbers continue to rise. 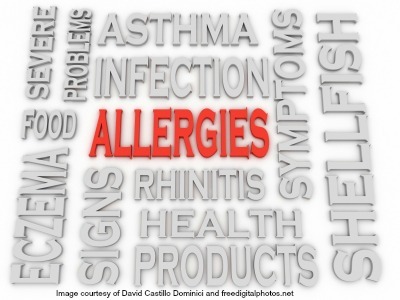 Why Do Food Allergies & Sensitivities Occur? A lot has changed in our diets over the last 15-20 years, many of our food choices nowadays are very questionable as we tend to be eating more food like products rather than real food. In 1996 Genetically Modified Organisms (GMOs) were introduced into our food supply and additives and pesticides are more prevalent in our foods than ever before. We also tend to over protect ourselves and our kids from germs – we can sometimes be too clean. The sterile environments we put ourselves in mean our immune systems don’t come in contact with allergens so our bodies aren’t able to fight them. Certain factors can also predispose a person to developing food allergies such as genetics (one or both parents are allergy sufferers). Other issues are that we tend to lack variety in our diet and can eat an excessive amount of the same type of food leading to issues. A healthy immune system is also key here, if this system is compromised it can lead to a number of food sensitivities and can include a lot of what the person eats. What’s the difference between a food allergy and sensitivity? A food allergy happens when the immune system mistakenly identifies a food as a harmful substance and launches an attack against it. This triggers the release of antibodies whose main goal is to destroy and eliminate the food (bad guy) through different responses in the body. It involves the excess production of an IgE antibody, which triggers the release of histamine from cells. This release of histamine results in symptoms such as hives, excess mucous, coughing, sneezing and vomiting. An allergic response is fast and very noticeable. The reactions can change very quickly from mild to severe in the worse causes causing anaphylactic shock as you often find with people that have peanut allergies. Food sensitivities are more subtle and they produce signs and symptoms that are often delayed. They can sometimes take hours or even 2-3 days to show symptoms. They involve the excess production of the IgG antibody. Food sensitivities are not as obvious, they are often called the hidden problem and detecting food sensitivities can feel like looking for a needle in a haystack. In a small mason jar, mix together all ingredients and use as needed in recipes calling for taco seasoning.